Festive bobbles, crocheted from tinsel yarn. Easy to tie around a plait or pony tail. Won’t have bits of tinsel falling out, unlike tree tinsel. Price is for 2 bobbles of the same colour. 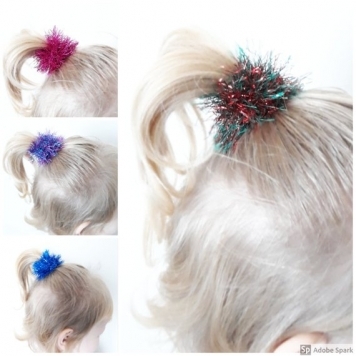 These festive bobbles are crocheted using tinsel yarn and are a smaller version of the Christmas hair scrunchies, so easier to tie around a plait or pony tail. They would look fantastic for girls to wear for a party or school Christmas disco and best of all they are made to last and wont have bits of tinsel falling out like if you were to wrap some tree tinsel into your hair. The listing is for 2 bobbles of the same colour unless you send a note with your order to request a second colour. There are 42 colours to pick from so something to suit everyone. To choose your colour look at the last picture and choose the matching colour from the drop down list.